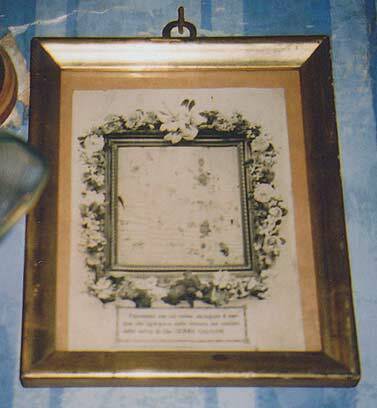 This is a photo of a cloth that still has Gemma’s dried blood on it from a mystical scourging she received. In a letter addressed to Father Germanus Gemma gladly exclaimed, “Father, how good Jesus is. … Jesus gives me some little present (suffering) and to the usual ones he has added another very precious one this week. He made me experience some blows of a whip all over my body, quite painful, Father. But I know that it can’t be anything compared to the terrible blows of my poor Jesus.